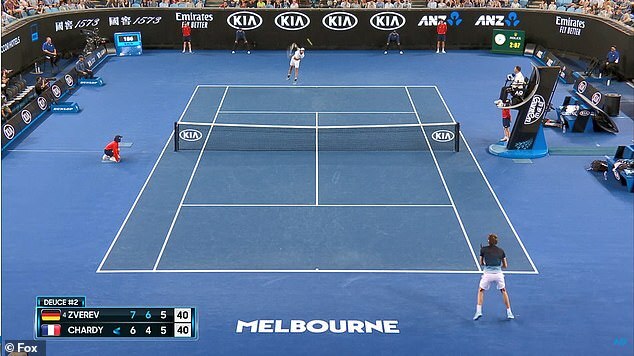 Channel Nine has been slammed for opting to show men’s Australian Open tennis matches on its free-to-air channels, while the matches of Serena Williams and world number one seed Simona Halep went without full TV coverage. 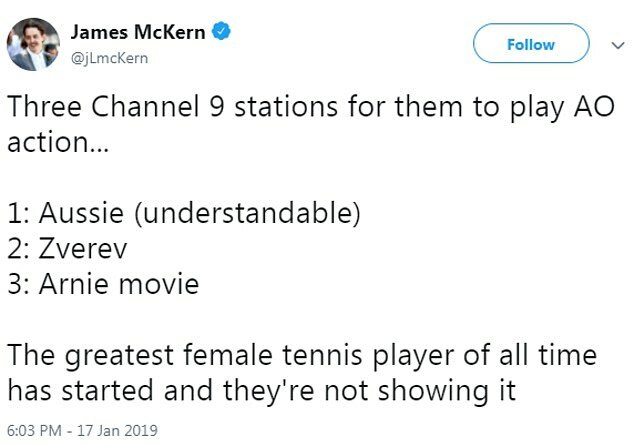 Furious viewers took to Twitter to vent their frustrations as Channel Nine chose to air the match between Alex Bolt and Gilles Simon on its main channel, and the match between Alexander Zverev and Jeremy Chardy on 9 Gem. The Bolt match was a five-set thriller and was being watched by 963,000 viewers, leaving Nine with a tough call over whether to switch to Williams’ clash. 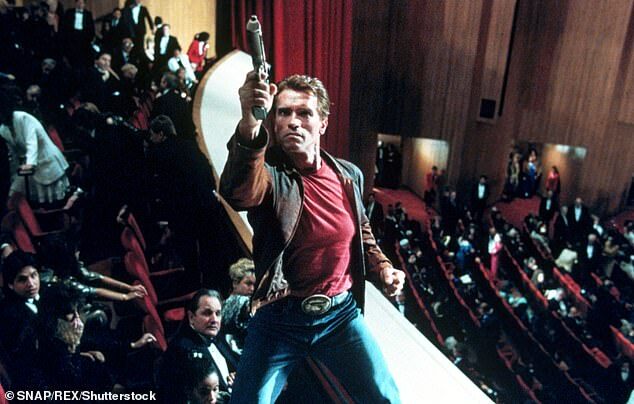 Over on Nine Go, Last Action Hero featuring Arnold Schwarzenegger was playing. 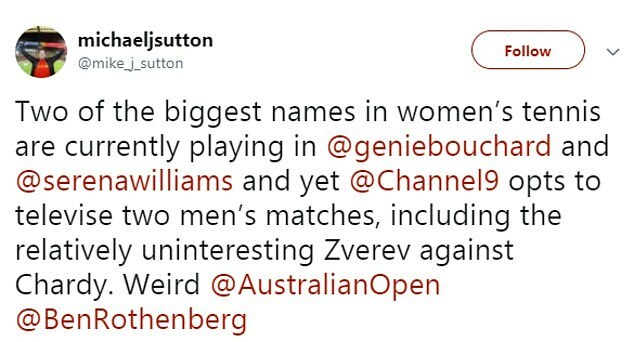 The Williams v Bouchard match had been available via 9now for its duration, but some viewers were irate that it was not on a main channel. ‘Three Channel 9 stations for them to play AO action,’ one disgruntled user wrote. Serena Williams is often referred to as the GOAT – greatest of all time – with a number 16 world seeding and 23 grand slam titles under her belt. 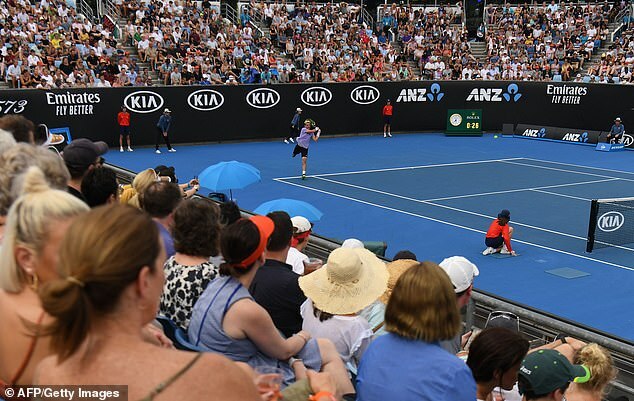 Her opponent on Thursday evening was world number 79 Eugenie Bouchard from Canada, and Williams secured a 6-2, 6-2 victory in just 70 minutes – but Australian viewers only caught the last half an hour. Female world number one seed Simona Halep’s game also failed to receive full Channel Nine coverage as she battled to success in an exhausting two hour match against American Sofia Kenin (37). ‘@Channel9 @AustralianOpen Just waited two hours to watch @serenawilliams play and now it’s not even being broadcast,’ another user wrote. Alexander Zverev from Germany is the fourth best player in the world, and his French opponent Jeremy Chardy comes in at number 36. Australia’s Alex Bolt ranks 155 in the world tennis rankings and he soared to victory against Gilles Simon from France with a ranking of 30. While some appreciated the excitement of having a low-ranking Australian player doing so well, many were incredulous there was no option to watch Serena Williams live on television. ‘Are @Channel9 seriously not going to show the Williams v Bouchard match because an Aussie is playing?! #AusOpen’ one person exclaimed. Serena Williams will face Ukrania’s Dayana Yastremska (57) in the next round, while Simona Halep is set to face Williams’ sister Venus (36).